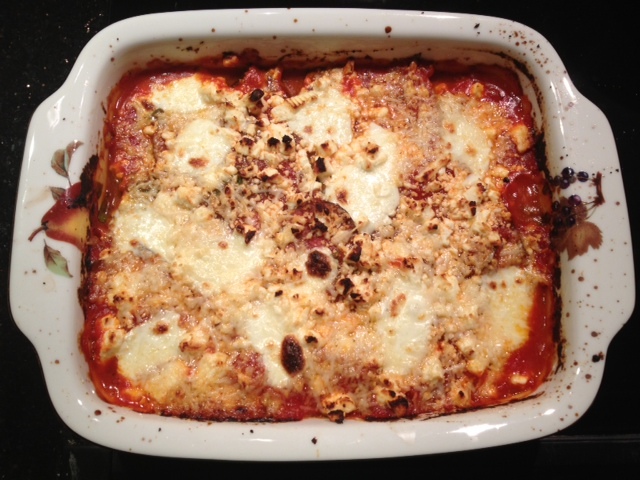 Four Cheese No-Fry Eggplant Parmesan. 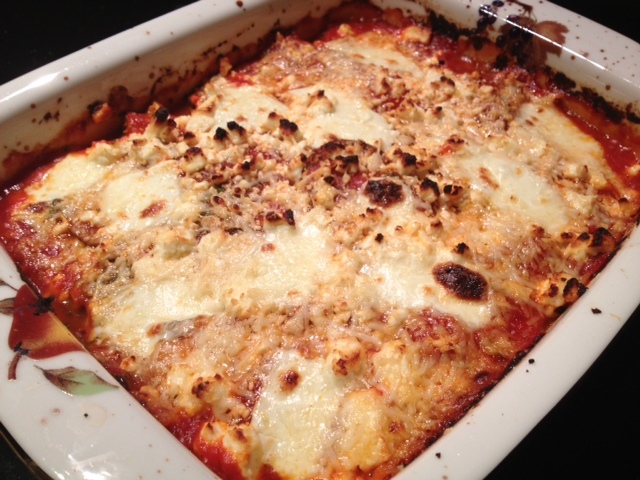 Typically eggplant Parmesan is heavily breaded and fried, but this no-fry eggplant parm is baked and has no added oil. The cheeses provide all the flavor and ooeygooey deliciousness that you need! Delizioso! 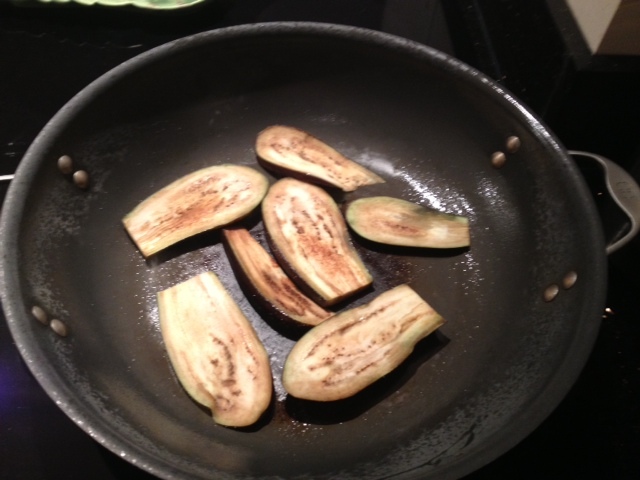 Begin by pan cooking the eggplant. Spray some cooking spray into a pan on medium-high heat, and cook each side of the eggplant for about 1 minute. This is just to lightly cook the eggplant, it will continue to cook in the oven. 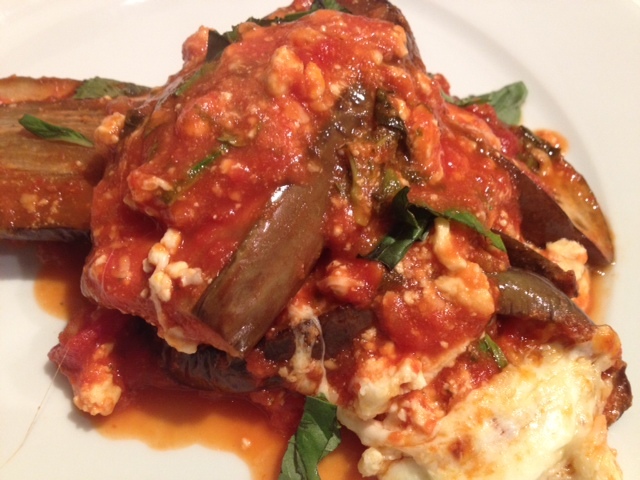 Once all your eggplant has been pan cooked, you can begin the process of layering it in a baking dish. 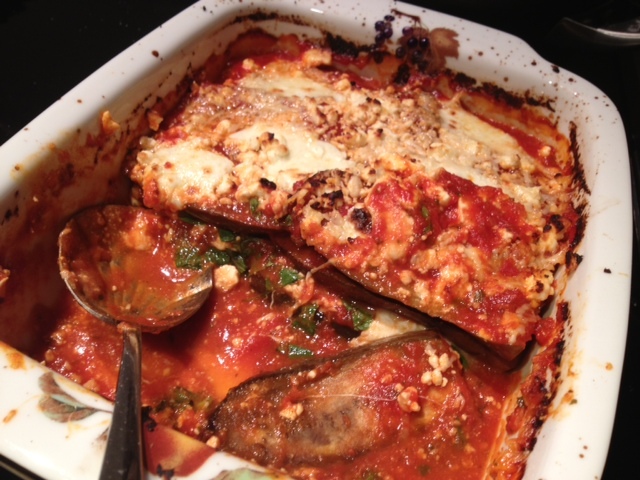 Depending on your baking dish, you may have a difference in layers, but I made mine with two layers of eggplant. 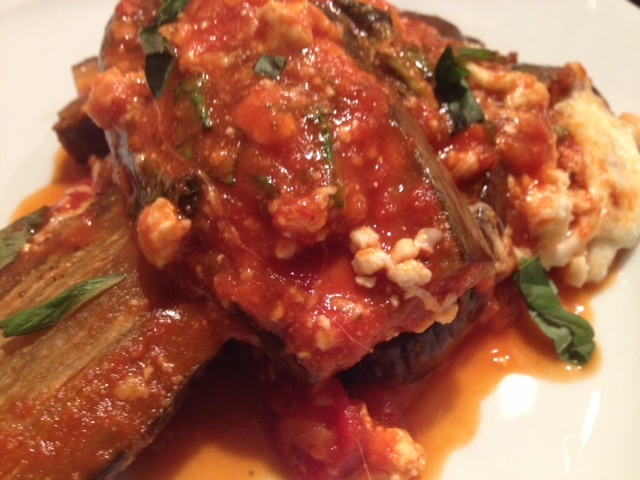 Begin with one layer of eggplant at the bottom of the dish. Try to line up the eggplant so there aren’t any gaps between the slices. 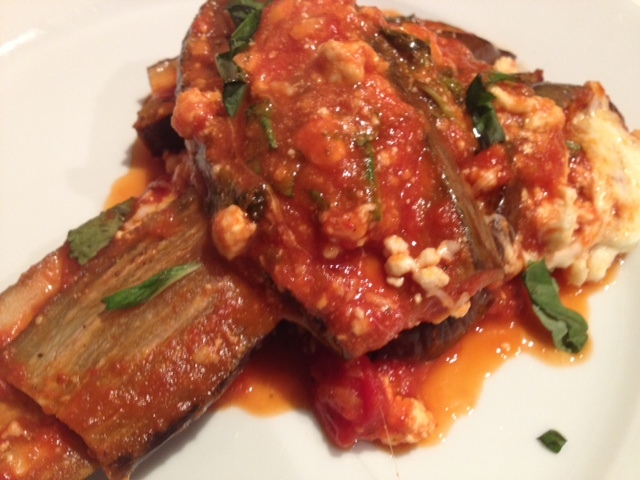 Spoon half of your tomato sauce over the eggplant. 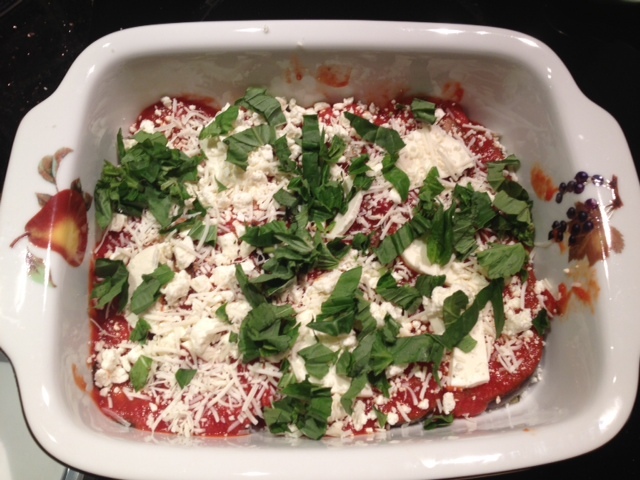 On top of that, layer half of the cheeses and all of the basil. Season the layer with dash of garlic salt and hot red pepper flakes. 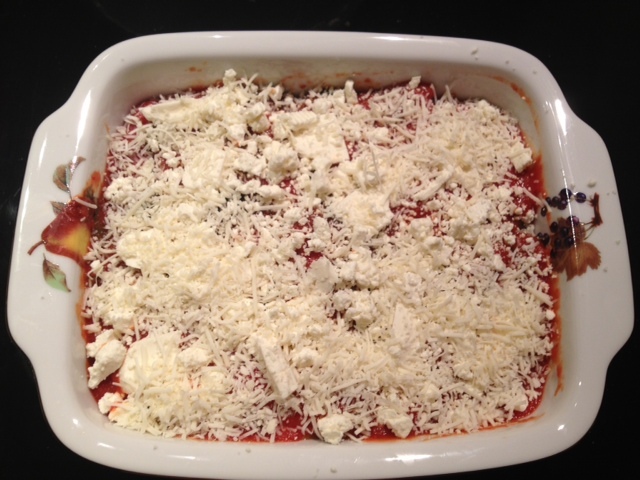 Then, layer more eggplant and top with the remainder of the cheeses and tomato sauce. Season with another dash of garlic salt and hot red pepper flakes. Bake in a 400 degree oven for 45 minutes. It will be bubbling and the cheeses will be melted and lightly browned. If you want to brown the top a bit more, you can always put it under the broiler for a few minutes. ← Tart & Tangy Two Bean Salad.